The climb generally follows the north ridge with much of the climbing on the west face of the ridge. 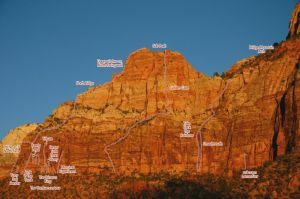 Many options exist for a starting point for this route. We chose a hand crack in a corner capped by a chock stone just left of the north prow of the formation. After three pitches on the north face we exited right onto easy 5th class terrain on the west face. On a previous attempt, Brody Greer and Scott Morley soloed the lower third of the route, staying on the west face from the get-go. Head for the crest of the ridge at about half its height. From there the route stays on the crest of the ridge. At the final headwall we climbed the thin crack on the gray north-facing wall that eventually widens and leans to the right. We aided the first 40 feet of this crack on thin cams and small to medium nuts. Hopefully future parties will free this short section of aid or develop a nearby free variation. In all, we roped up for 12 pitches and soloed at least 400 feet.